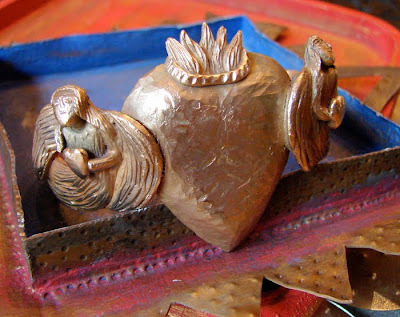 I love to work with metal clays and create a lot of different designs but I notice that although I LOVE to wear bracelets or cuffs I have not made almost any of them. A really good friend of mine is celebrating her 30 years anniversary with her wonderful store here in San Antonio and she is organizing an event for next month for the celebration. She invited some artist to make bracelets ( her favorite jewelry piece) to make an incredible "Bracelet Show." I was one of the lucky ones to get invited and this invitation made me think about why I have not been making any bracelets. I am happy to participate in this event and also I am happy to have the opportunity to experiment with bracelets designs with metal clay. 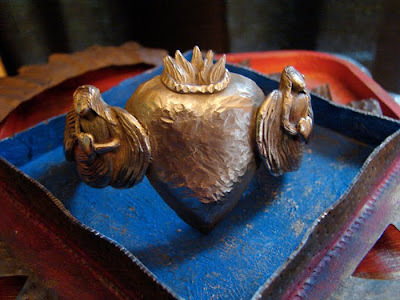 The first design I have in my head was of two angels holding a big heart in the center and the best metal clay for the feeling I wanted in the design was bronze clay. This piece was a challenge for me because is formed by pieces that I assembled together little by little. 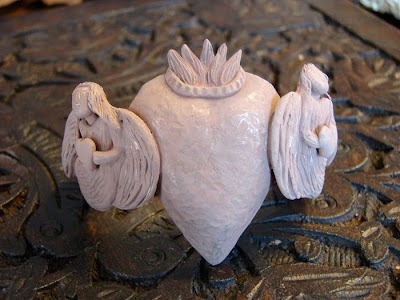 The heart was made first, then I made the faces and carved them, my next step was to hand sculpt the torsos, then the lower part of the dresses, the arms, one wing in each angel, the other wing and add the hearts in their arms and finally attached the angels to the heart. 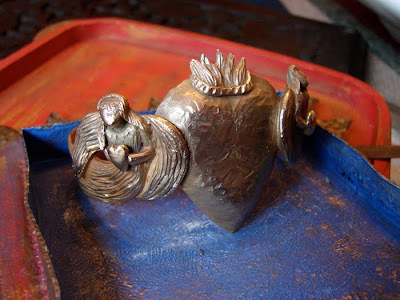 I was afraid the piece will not fired in one piece but when I took the cuff out of the charcoal and saw her in one piece, I was VERY happy !!!!!! Now I have to anneal the piece to be able to recover the form of the cuff. This will be my last test to confirm if my cuff is perfectly sinter. amazing work! me gusta mucho! 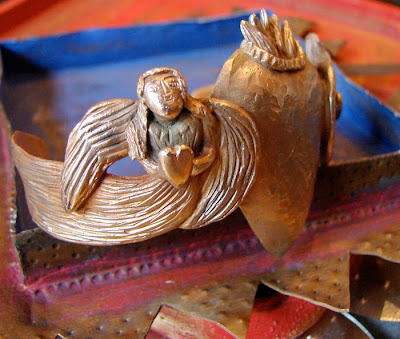 Wow, your new cuff is gorgeous!